So you rode your Fat Boy to the races and forgot to bring your point-n-shoot? This product will solve your problems and match your t-shirt! 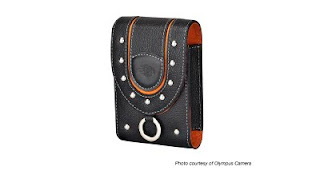 The Olympus Harley Davidson Classic Case (Black with Flame Accent) is a leather case with an orange suede lining. 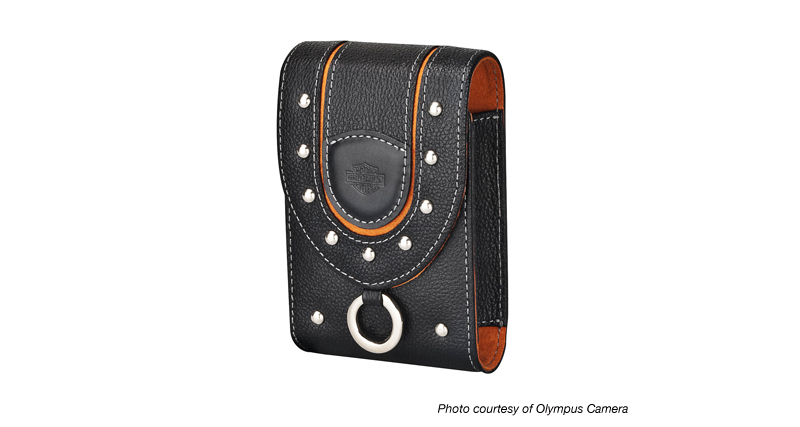 It is designed to carry most Olympus point and shoot digital cameras plus many mobile phones, smart phones or MP3 players. All held in place with a magnetic snap plus it has a small pocket inside for extra memory cards because who know how many gals will be flashing you? Comedy legend and avid motorcycle fan Ross Noble is embarking on a unique tour this month, asking bike fans and Twitter followers to guide him on a trip to find the best of biking Britain. The week-long ‘Sit Down Tour’ (May 24-30), Ross will take in England, Scotland and Wales on board Triumph’s 500,000th bike, a uniquely liveried Speed Triple. 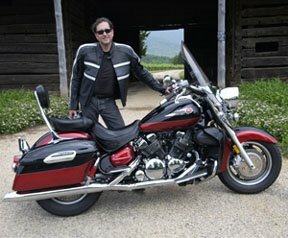 As well as marking the significant milestone of the half-millionth bike to roll off Triumph’s production line since 1990, the tour is also a celebration of Ross Noble’s 20 years on the stand-up comedy circuit and an opportunity for him to recharge his creative batteries while indulging his passion for motorbikes. Riding the Speed Triple, Ross will be travelling around the UK, guided only by fans via Twitter, to uncover some of Britain’s best biking routes. A few stops are already planned, such as visits to two brand new Triumph stores in Reading and Manchester, while others will be entirely shaped by daily tweets to unearth the great places and characters along the way. Carrying VIN number 500,000 and sporting a one-off red, white and blue paint scheme, created using a brand new production technique, Ross’s Speed Triple is destined to become a collector’s item. After the Sit Down Tour is over, Ross will take the Speed Triple to the Goodwood Festival of Speed on July 1, where it will be auctioned with all monies raised going to the charity, Riders for Health. The charity has been championed previously by Ross Noble and provides vital motorbike transport for medics to reach otherwise inaccessible parts of rural Africa. Commenting on the Sit Down Tour, Guy Masters, general manager of Triumph UK, said: "Reaching the 500,000th bike in just twenty years is a terrific achievement and a credit to the hard work of everyone at Triumph and our dealer partners globally. To mark the occasion and also to celebrate our British roots, we wanted to do something that gave our customers a chance to get involved. We were delighted when Ross agreed to help us mark the milestone with his Sit Down Tour, which will involve dealers, riders and fans across the UK." The Sit Down Tour leaves Triumph’s Hinckley factory on Tuesday May 24 and finishes in Ross’s home town of Newcastle, at the Triumph North East dealer, on Bank Holiday Monday, May 30. Follow Ross’s progress via his own Twitter feed @therealrossnoble or Triumph’s @officialtriumph and for more information go to Triumph’s official Facebook page http://www.facebook.com/officialtriumph . Apparently the French Minister of Transportation announced that the police would start ticketing motorcyclists for lane splitting which led to this protest clogging the streets of Paris. The Afterwards the Minister announced that if the bikers didn't like it they could ride the subway. Which they did, en mass with helmets and leathers. The Department is re-thinking the policy.